on birds and other wildlife issues. Curry & Kerlinger has compiled the following information from environmental organizations and goverment agencies. This list is meant to inform the public and to put wind turbine fatalities in perspecitve. Dr. Daniel Klem of Muhlenberg College has done studies over a period of 20 years, looking at bird collisions with windows. His conclusion: glass kills more birds than any other human related factor. Scientists estimate the number of birds killed by cars and trucks on the nation's highways to be 50 to 100 million a year. 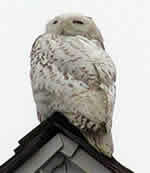 Those statistics were cited in reports published by the National Institute for Urban Wildlife and U.S. Fish and Wildlife Service. Estimates made by the U.S. Fish and Wildife Service demonstrate millions of birds die each year as a result of colliding with transmission lines. Pesticides likely poison an estimated 67 million birds per year according to the Smithsonian Institution. Cutting hay may kill up to a million more birds a year. Suburban sprawl is a silent but deadly killer. The National Audubon Society says loss of bird habitat is the greatest threat to bird populations. U.S. Fish and Wildlife Service estimates that bird collisions with tall, lighted communications towers, and their guy wires result in 4 to 10 million bird deaths a year. U.S. Fish and Wildlife Service biologists and other conservationists believe that large numbers of birds inadvertently drown in livestock water tanks. Logging and strip mining destroy bird habitat. According to the National Audubon Society, habitat destruction is the leading cause of bird population declines. The U.S. Fish and Wildlife Service and the Ornithological Council report that 40 thousand seabirds per year are killed in the Gulf of Alaska by longline fishing operations. These same sources say long lining and gill netting kill large numbers of birds in other parts of the country as well. Experts estimate that more than one thousand hawks, eagles, falcons and owls are electrocuted on transmission lines and poles each year. According to the U.S. Fish and Wildife Service, more than 100 million ducks, geese, swans, doves, shorebirds, rails, cranes, among others are harvested legally each year. Click here for a complete summary of studies on wind turbines and birds.